I've been asked lots of questions about my illustrations, like how I did it, manually or digitally, photoshop or illustrators, using mouse or wacom, etc etc. Kak Kitty - who is a creatively amazing person I met at Gudily's workshop last year - offered me to have my own workshop (gasp!). I think this is a great chance to answer all of your questions not only in theory, but technically! 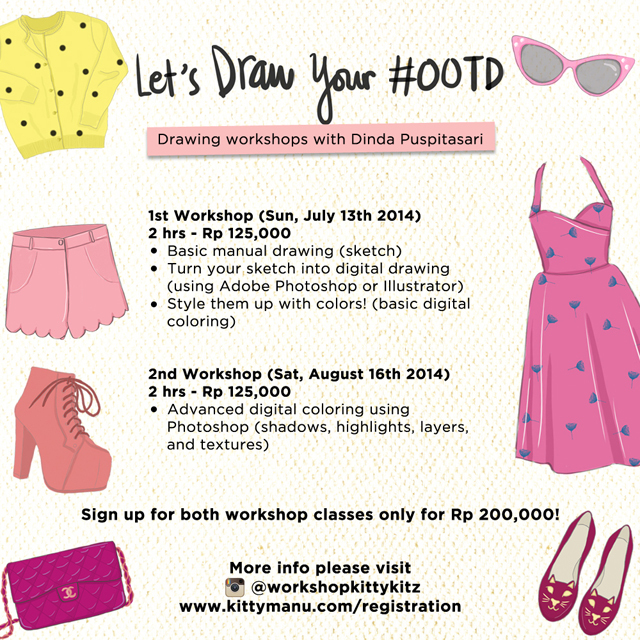 So my drawing workshop will be focused on drawing your outfit (because outfit/fashion is my favorite thing!). The workshop is divided into 2 classes, the first one is basic and the second one is more advanced in terms of coloring, details can be read below. All you need to bring is your own laptop, installed with Photoshop, and a Wacom would be a great match. Don't worry if you don't have a Wacom, a mouse can do great things as well. Kak dinda berminat buat workshop di Bandung gak?